George Westinghouse died in 1914. Sixteen years later, some 55,000 workers at his former firms decided they wanted to do something to honor him. To that end, the employees chipped in to erect a monument in Pittsburgh, the heart of Westinghouse’s indus trial empire. $200,000 ($2,500,000 in today’s dollars) was raised. The project took five years to complete. 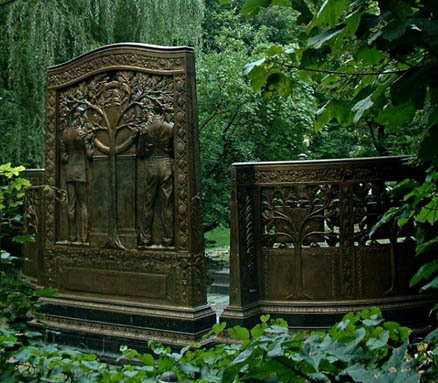 The Westinghouse Memorial is located in Schenley Park, not far from the campus of Carnegie Mellon University. Architects Henry Hornbostel and Eric Fisher Wood designed the monument and the surrounding landscape, including the pond, trees, and location of black granite benches. Hornbostel designed more than 225 buildings, bridges, and monuments in the United States: 110 of which are in the Pittsburgh area. Significant ones nearby include Rodef Shalom Temple, Soldiers and Sailors National Military Museum and Memorial, Carnegie Mellon College of Fine Arts, and the initial campus design of Carnegie Mellon University. Wood, in addition to being an architect and civil engineer, was an officer in the U.S. Army during both World War I and II, retiring with the rank of Brigadier General. Wood was one of the key founders of the American Legion veterans' organization. 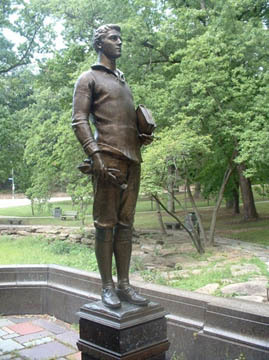 The organizers chose sculptor Daniel Chester French, perhaps the most famous sculptor of all time, who also created the statue in the Lincoln Memorial, to design the sculptures, including a statue titled “The Spirit of American Youth,” a snapshot of a young man taking inspiration from the life of Westinghouse. Critics have called this bronze sculpture “the finest portrayal of American boyhood,” The monument is a beautiful allegory. An all-American boy (surely one of French’s best works) stands in the prow of a boat, his hat in one hand and books in the other, and learns about the incredible accomplishments of the genius Westinghouse, opened up in front of him like a scroll. You can read the wonder on his face, and in the careless way he crumples his hat, as if he had completely forgotten it was in his hand. His sweater is pushed up from all that absentminded fiddling with the hat. The message is clear: future generations will judge Westinghouse by his fruits, and they will be astounded. 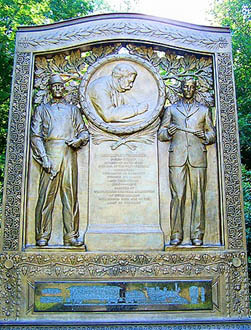 The center portion of the monument depicts Westinghouse between a mechanic and an engineer, with the surrounding panels created by sculptor Paul Fjelde illustrating Westinghouse’s achievements. All the bronze figures and reliefs were originally covered in gold leaf, but the work of vandals forced the removal of the gold leaf in 1941. Few venture behind the Westinghouse Memorial, but a special reward awaits those who do. Instead of a blank wall, the reliefs are as detailed as the ones in front, seemingly portraying the aesthetic legitimacy that the monument must have a logical foundation to back up the front truths. 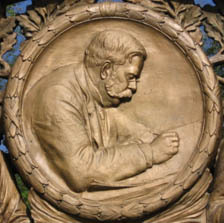 Masaniello Piccirilli’s name is included as one of the sculpture artists on the back of the Westinghouse Memorial, along with Daniel Chester French and Paul Fjelde. The Piccirilli Family, father and six sons, were renowned marble carvers and sculptors who carved a large number of the most significant marble sculptures in the United States, including Daniel Chester French’s colossal Abraham Lincoln in the Lincoln Memorial. At that time, most prominent sculptors would create their original work in clay. From that clay model a caster would generate a plaster model. The model would then be sent to the Piccirilli Brothers who would carve it from stone, typically marble, although limestone and granite were also used. The brothers became the carvers of choice for a large number of American sculptors of the time including Daniel Chester French. When the Piccirilli Brothers studio closed it doors, no move was made to secure their records, so the accounts of much of what they had accomplished was lost. This memorial unveiled October 6, 1930, in honor of George Westinghouse is an enduring testimonial to the esteem, affection and loyalty of 60,000 employees of the great industrial organizations of which he was the founder. In his later years rightly called “The Greatest Living Engineer”, George Westinghouse accomplished much of first importance to mankind through his ingenuity, persistence, courage, integrity and leadership. By the invention of the air brake and of automatic signaling devices, he led the world in the development of appliances for the promotion of speed, safety and economy of transportation. By his early vision of the value the alternating current electric system, he brought about a revolution in the transmission of electric power. His achievements were great, his energy and enthusiasm boundless, and his character beyond reproach; a shining mark for the guidance and encouragement of American youth. On dedication day, nearly 15,000 people crowded the memorial site to hear the speeches and bands that were part of the festivities. A lavish banquet for the movers and shakers who came to honor Westinghouse was held the night before at the William Penn Hotel. On the eighty-fourth anniversary of the inventor's birth, the nations of the world joined hands in extolling the character of the man who had rendered an "inestimable service to mankind and whose contributions to industry played so large a part in the progress of civilization." An admiring crowd that began to gather in the park during the early afternoon grew to immense proportions before the program was started and stretched far out over the adjoining hillsides with thousands content to stand through the proceedings. It was he who first made safety the handmaiden of speed. It was he who was a leader in multiplying the world's motive power on land and sea. It was he who brightened the pathway and lightened the burden of God's children as they toiled and traveled on their never-ending journey down the ages. After Burke's address, the unveiling took place to the accompaniment of the combined Westinghouse bands, and the Westinghouse and Union Switch and Signal Company employee choruses sang the “Star Spangled Banner” and “America.” The Right Rev. Alexander Mann, bishop of the Episcopal Diocese of Pittsburgh, gave the invocation. Men from workshops which rest their foundations on the inventive genius of Westinghouse joined with leaders assembled from throughout the nation in dedicating the George Westinghouse Memorial in Schenley Park yesterday. Industrial giants of many nations paid tribute yesterday to the memory of a boy who toyed with trinkets -- to George Westinghouse, who gave the world 400 inventions and almost single-handed revolutionized modern mechanics. George Westinghouse had that combination which is so rare of both inventive and business genius. Because he lived, industrial life is more human, more safe and more productive. He ranks as one of the great benefactors of mankind. After years of planning, fundraising, and restoration, the George Westinghouse Memorial in Schenley Park was re-dedicated on October 6, 2016 at a special “Birthday Party” celebration for the genius inventor. But for many of those in attendance it was also a chance to pay their respects to a man whose influence touched their lives, or their parents’ or grandparents’ lives. It was also a chance for Westinghouse family members to reunite at the home of their famous ancestor and witness the affection that is still felt for this man more than a hundred years after his passing. Dignitaries who spoke at the Ceremony included: Meg Cheever, Pittsburgh Parks Conservancy; Guy Costa, Mayor’s Office; Sylvia Fields, Eaton Hall Foundation; Ray Betler, Wabtec; David Howell, Westinghouse Electric Company; and George Westinghouse IV. The Mayor’s Proclamation was read, declaring October 6, 2016 as George Westinghouse Day. David Howell commented: “Seeing the Memorial restored to a true work of art made me reflect on the meaning of the monument. 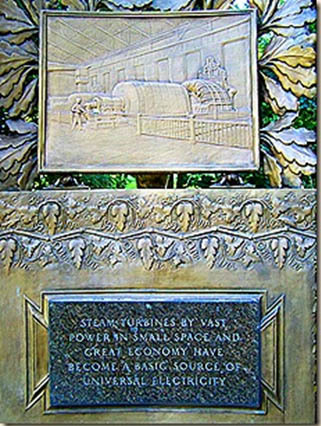 I felt the same awe and admiration that the sculptor captured in the face of the young boy as he read George Westinghouse’s accomplishments listed on the bronze panels. I was humbled by the statues of the mechanic and the engineer, reminding visitors of their dedication to their beloved “Uncle George.” Above all, I was reminded of the immense pride I feel each and every day I come to work. I have spent the entirety of my professional career as a Westinghouse employee, and am fortunate enough to have both of my daughters join me here in this distinguished company. My family continues to be inspired by George Westinghouse’s achievements, as do so many others across the globe. Earlier, I had the pleasure of meeting Mernie Berger, a 93-year old Pittsburgh resident who, even in her advanced years, returned to the Memorial to honor the late innovator. Her story is an amazing one indeed. On a warm October day back in 1930, when she was just seven years old, Mernie’s father – employed as an electrical engineer for Westinghouse at the time – brought Mernie and her sister to the original monument dedication. She recalled how proud her father was as the landmark was erected, and the palpable emotion in the air as they celebrated alongside the thousands of Westinghouse employees who gathered to honor the legacy of George Westinghouse. Other special guests at the ceremony were Some 16 direct descendants of George Westinghouse who traveled into Pittsburgh for a “family reunion” that was primarily centered the Memorial Rededication Ceremony, along with visits to Wilmerding, East Pittsburgh, and Point Breeze which was organized by Westinghouse SURE. The Family members were very moved by all the events and the warm Pittsburgh hospitality.